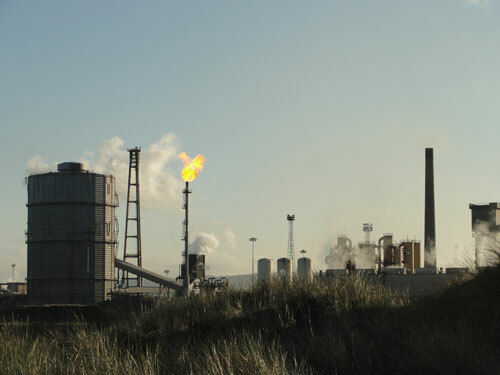 A Line Made by Listening is a series of recordings that trace an audible line through South Gare, a designated site of special scientific interest in Redcar, UK. Travelling along a 1.7 Kilometre straight line the journey begins with the sound of waterbirds feeding amongst the lapping water of the North Sea and moves through sand dunes and marram grass; toward the faint howling of a wind-monitoring device. The movement advances south towards an area known as Bran Sands, passing the drone of a transporter ship entering the Tees Mouth Harbour before finally coming to rest at the edge of Sahaviriya Steel Industries. The piece highlights the wealth of natural and industrial behaviour exhibited within this unique stretch of reclaimed land, built between 1861-1884. A Line Made by Listening is part of Mark Peter Wright’s ongoing research into the area of South Gare and is supported by CRiSAP, London.